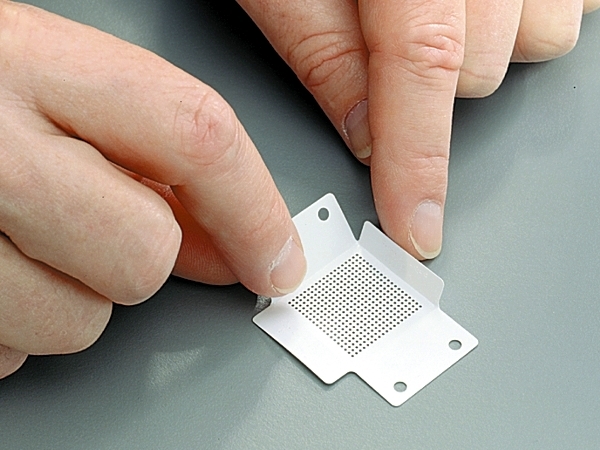 If you've been using metal stencils for BGA rework, we have some great news for you. Flextac BGA Rework Stencils are a creative product that's a major improvement over what you may be using now. These flexible solder paste stencils are laser cut from high quality, anti-static polymer film with a residue-free adhesive backing. The adhesive seals around each BGA pad to prevent solder paste from bleeding under the stencil when the paste is applied. Because they are self-sticking, no tape or fixture is needed. CircuitMedic Stencils are easy to use and leave no residue on the board surface. 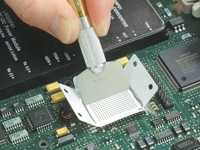 Typical BGA rework stencils are made from metal and require a fixture or taping to position them and hold them in place. Metal stencils warp easily, and if the circuit board has undulations in the board surface, the metal stencil will not sit flat. 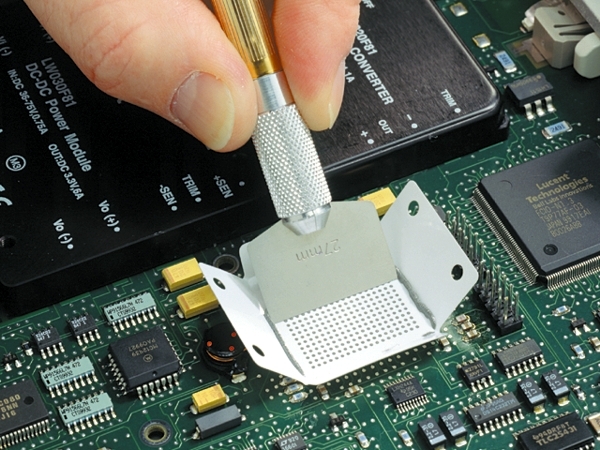 Since there is no gasket-like seal, solder paste can easily bleed under metal stencils when paste is applied with a squeegee. Metal stencils require tedious stencil cleaning. To use metal stencils effectively, a high level of operator skill is required. Step 1: Select a Flextac BGA Rework Stencil with proper aperture pattern, ball count and thickness. Hundreds of different sizes, shapes and thicknesses are available. Fold up the side tabs. 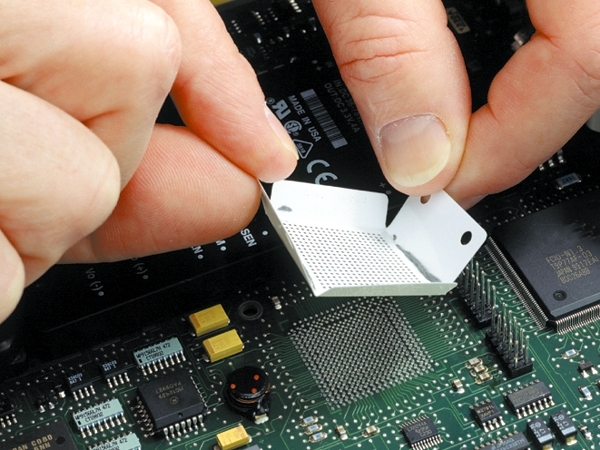 The side tabs will prevent solder paste from spilling out and contaminating the circuit board surface. Step 2: Peel off the cover film to expose the adhesive backing. The adhesive backing seals around each BGA pad to prevent solder paste from bleeding under the stencil when the paste is applied. Flextac BGA Rework Stencils leave no adhesive residue on the circuit board surface. Step 3: Place the Flextac BGA Rework Stencils in position using the side tabs. Check to be sure the aperture openings are aligned with the BGA pads on the circuit board surface. 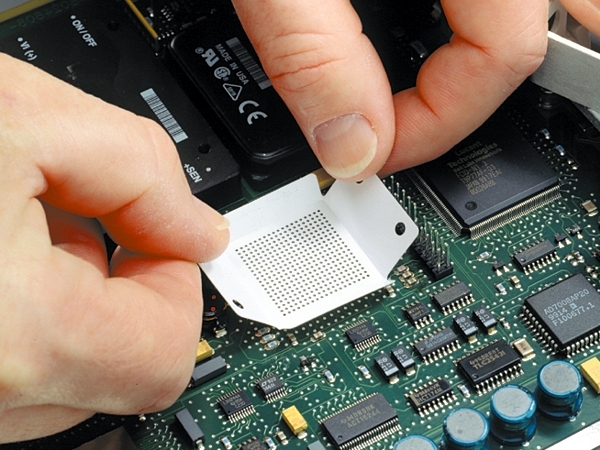 If the Flextac BGA Rework Stencils is not correctly positioned, lift it, reposition it, and recheck the position. No fixture is used. Step 4: Apply a small amount of solder paste to the Flextac BGA Rework Stencils and use a small squeegee to spread the paste. The adhesive backing seals around each BGA pad to prevent solder paste from squeezing under the stencil. Step 5: Once the apertures are filled, peel up the stencil leaving a perfect deposit of solder on each BGA pad. Although Flextac BGA Rework Stencils are disposable, they can be used several times. Include a residue-free adhesive backing. Adhesive backing seals around BGA pads to prevent solder paste bleed. Disposable - eliminates tedious stencil cleaning. Flexible - conforms to board surface. Products may be ordered from distributors around the world. See our Distributor List. 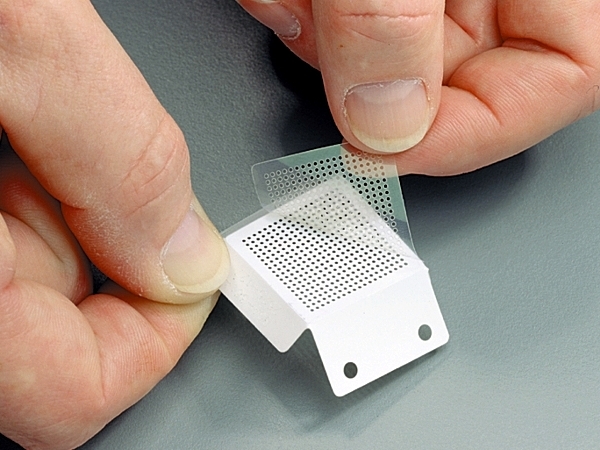 A custom stencil pattern can be made for most BGA components. The setup and engineering charge for new stencils is a one-time fee of $750.00. The initial minimum order is 5 packages of 10. Complete the Custom BGA Rework Stencil Request Form on this page and we will provide you with price and delivery information. We stock many sizes and shapes of Flextac Rework Stencils. To see if the quantity you desire is available, click the "Order" button. If the size you need is not immediately available, we may be able to provide a metal stencil. Contact us for details. * Stencils Indicated Have Minimum Order 5 packages. 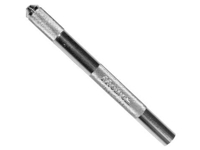 B6-026-1018-080 26 .006" (0.152 mm) / .020" x .065"
B6-068-0915-127 68 .006" (0.152 mm) / .028" x.028"
B4-120-0756-080 120 .004" (0.102 mm) / .018" x .045"
Complete this form to receive price and delivery information for a custom BGA rework stencil.